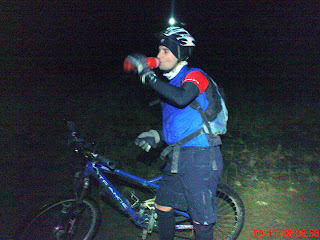 Starting at 6am it was pitch black and b##### cold when we set off from the car park at the bottom of Glentress! After all Baz's boasting about the lumen power of his lights, he suddenly remembered he'd forgotten to change the batteries since the last ride, much chuckling from myself! However the lights were good enough to last till daylight at last arrived so no harm done. We were nearly 7 miles up the black route this morning before the lights could be safely switched off, still another 6 or 7 weeks till the shortest day, so fully charged batteries will be needed from now on. 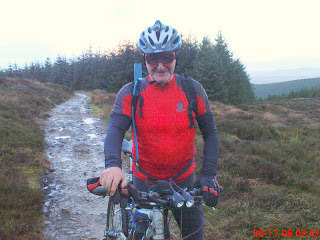 I had found a pair of goggles last week, abandoned at the side of the trail, and decided to wear them this week for what I foolishly thought was a rather racy look, that look didn't really come off , though the goggles did keep my eyes dirt free on the descents so they might become a fixture! 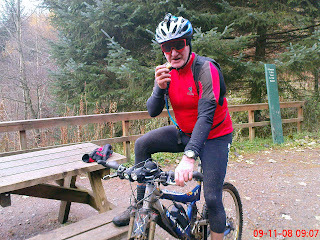 We usually have about 3 stops for an energy bar and a drink on the ride, by the end a bacon roll is all I can usually think about as I'm generally starving. 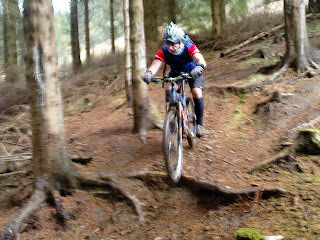 The bottom photo shows Baz negotiating the notorious roots and stepdown on Andys Flume, a section that's quite technical and has been known to have me and the bike part company more than once, but happily today I managed to keep on the saddle........... well nearly all the time. Apart from one puncture today's ride was incident free and next week with the lights and our own batteries fully charged we'll be ready for another challenge. Temperatures today varied from plus 4 Celsius to zero, with ice forming on the puddles higher up the tracks.